Bankcard Profit System Reviews – Legit or Scam? 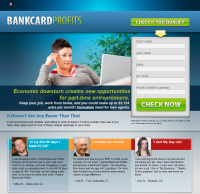 Bankcard Profits is a relatively new company promoting a work at home business opportunity. They claim that by using their Bankcard Profit System, anyone, regardless of experience, can make an extra $3,000+ a month, just by working 3-5 hrs per week. The term Bankcard Agent seems to be unique to the Bankcard Profits website. The actual position is considered a Merchant Processing Agent, or a Merchant Account Associate, depending on what company you’d be employed by.